Tech articles: What is a Floppy Disk? Kids who use pen drives and external hard discs or even store data on the cloud will never know the essence of a floppy disk. Once computers reached homes, educational institutes and offices, floppy disk became an essential instrument to store, transfer, as well as share data. Those PPT presentations and Word document projects or the Excel sheets containing the company’s financial data would be easily transferred to a floppy disk. Soon, floppy disk lost their fan-following once CD’s, especially re writable CD’s came into picture. Soon, CD’s phased out to an extent after pen drives came into use. Those who have never heard of them before, let us talk about what is a floppy disk in the following article. A floppy disk was not a floppy instrument as the name suggests. This square shaped diskette was a storage media file that could store electronic data. It had a protective casing that kept the disk (which is actually floppy/ flexible) protected. It was coated with iron oxide and stored data magnetically. Floppy disk was first created by IBM in the year 1967. It was created as an alternative to the super-expensive external hard drives. The floppy disks were initially used only for installation of a new computer program on the computer. They were about 8 inches in diameter and were read-only. This meant user could not write on these disks. The capacity of these disks was only 80KB of data. By the year 1978, a new disk of about 5.25 inches was introduced that could hold about 360KB of data. Later a 5.25 inch floppy could store 1.2 MB dat. Then, in 1987 the 3.5 inch HD (high density) floppy disk were released that could hold 1.44MB of data were released. Soon, these 3.5 inch floppy disk became the standard instrument for distributing software as well as storing data. How to Use Floppy Disk? The older versions of computer did not have CD-ROM drive or a USB drive, instead there were slots to read floppy disk. Just like a CD, one had to push the floppy into the floppy drive slot in the computer’s CPU. Is Floppy Disk In Use Today? There are quite a few computers today that still support a floppy disk. Computers built after the year 2000 no longer came with floppy disk drive. Soon, Microsoft Windows no longer supported floppy drives. Floppy disks were vulnerable to dust, moisture as well as heat. It was not very sturdy and could easily get damaged. 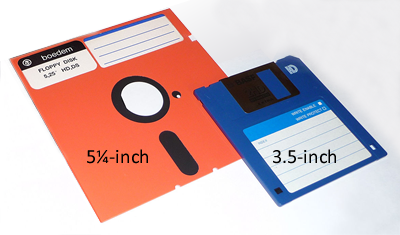 Although floppy disks had many drawbacks including less storage space, they helped many users carry and store their data. Today, they are a thing of the past, but still had great use during their peak days.